Can you spot it above ? Detail : The Beatles seventh official album release. This release came out the same day as the double-A sided single, "Eleanor Rigby/Yellow Submarine" ... the first time that the Fab Four had released a single on the same day as the album from which the tracks came. Arguably showing the Beatles at their creative zenith. 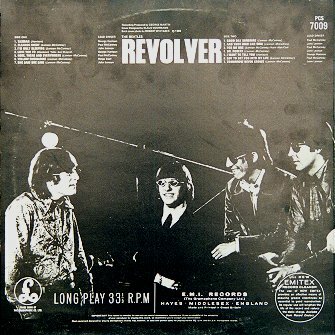 Lyrically and musically innovative, "Revolver" IS a pop masterpiece. Revolver had advance orders of 300,000 in Britain and yet, is only given a final sale figure of 500,000. Globally, sales are estimated at over two million. 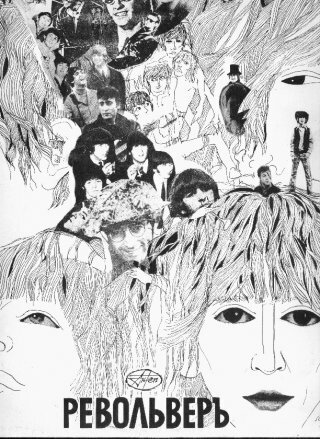 Front cover features artwork by Klaus Voormann, a friend of The Beatles from their Hamburg days. Voormann went on to play bass with Manfred Mann (he replaced Jack Bruce !) 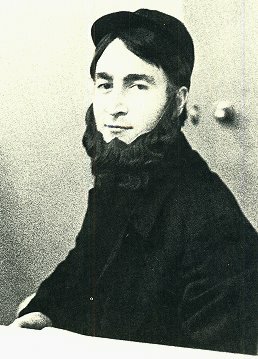 and later, of course, played with John and the Plastic Ono Band. 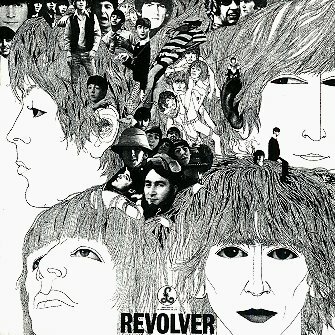 Look dead centre at the Revolver sleeve above, and then look at the original Robert Freeman picture below it from 1966 ! ... Klaus Voorman used this picture as the centrepiece (which may explain to you why John looked "odd"). The rear cover photograph is by Robert Whitaker. The album was also part of "The Beatles Collection" 13 album box set (see Beatles Collection). This set had a catalogue number of BEA CD 25/2, and was in a limited edition of just 2,500 copies. The C.D. was also part of "The Beatles Box" 15 C.D. box set (see Beatles C.D. Box). 09/09/09 (Number Nine, Number Nine, Number Nine) - the album was re-released as part of the Beatles In Stereo Remasters collection. 13th September 2009 it re-entered the chart again at number 9 in the third highest position of SEVENTEEN chart positions The Beatles captured in one amazing week. 20th September 2009 - dropped eight places down to number 17. 27th September 2009 - dropped twenty-three places down to number 40. 4th October 2009 - dropped twenty-three places down to number 63. 11th October 2009 - dropped twenty-five places down to number 88 - which is outside the official chart and doesn't count for longevity purposes. 18th October 2009 - No longer listed in the Top 100. In 2010 iTunes (a digital download agency) were given access to The Beatles product, which now meant each individual Beatles track was available to download to internet connected devices. These downloads had to be paid for and the number of sales were permitted to be counted for chart purposes as "singles" (although JPGR doesn't concur with this process). But it is, of course, preposterous to count Eleanor Rigby as a Beatles single. It wasn't. 1966 - Catalogue number TA-PMC 7009 (3¾ ips twin-track mono tape) - first edition (mono only) in a cardboard box. TD-PCS 7009 (3¾ ips 4-track stereo) these editions in a "jewel" box. The album was released on stereo cassette tape (1⅞ ips) - Catalogue number - TC-PCS 7009. In November 1987 the album was re-released on cassette tape (stereo only) - Catalogue number - TC-PCS 7009 (Originally released September 1966). Taxman Harrison Recorded 20th April 1966 - 4 takes ... all discarded. Love You To Harrison Original working title, "Granny Smith"
Good Day Sunshine Lennon-McCartney Recorded 8th June 1966 in 3 takes, backing track only. Dr. Robert Lennon-McCartney Recorded 17th April 1966 in 7 takes, backing track only. I Want To Tell You Harrison Original title, "Laxton's Superb", then entitled, "I Don't Know"
Tomorrow Never Knows Lennon-McCartney Original working title, "Mark I"
What a start ... dare I say, the most innovative track on the album - years ahead of it's time, and yet, the very first track recorded at the start of the Revolver sessions. "Taxman" The mono version has a cowbell that starts during the second verse, on the stereo release it does not start until half-way through the second chorus. "I'm Only Sleeping" The Lennon lead vocal is the same in both, but in the mono version the backwards guitar effects are in different places to the stereo mix. "Yellow Submarine" The mono version has an opening guitar chord, which is missing on the stereo version. The mono version has John's shouted repeats of Ringo's lines beginning one line sooner, and louder than on the stereo version. "Got To Get You Into My Life" Paul's vocals during the fade-out are noticeably different between the mono and stereo mixes, this would suggest that the vocal is therefore taken from different takes for the two mixes. "Tomorrow Never Knows" The mono version has different backwards tape effects than those on the stereo version. The standard yellow block writing Parlophone label. The "All rights of the manufacturer" message around the edge of the label now starts with "The Gramophone Co. Ltd."
The label DOES have "Sold in the U.K..." statement. There is a much rarer mono version [very] first pressing, hastily withdrawn, which had a different mix of "Tomorrow Never Knows" (known as "remix 11") this has a matrix number on side 2 of XEX 606-1 and is worth up to �200 ! The "All rights of the manufacturer" message around the edge of the label starts with "The Gramophone Co. Ltd."
The label does NOT have "Sold in the U.K..." statement. Now with a silver/black Parlophone label. The "All rights of the manufacturer" message around the edge of the label now starts with "EMI Records Ltd."
The label has one EMI boxed logo. The label has TWO EMI boxed logos. Now with a yellow/black Parlophone label. This release is on a lightweight vinyl. Now with a Black and Silver Parlophone label. "This album has been Direct Metal Mastered From a Digitally Re-mastered Original Tape to give the best possible sound quality"
This release is (surprisingly) on a lightweight vinyl. I have a Russian double L.P. which couples Revolver WITH Sgt. Peppers !! This utterly splendid double album is in a gatefold sleeve, which has a Sgt. Pepper front, with all the Words in Russian ! ... open it out and it has a similar Sgt. Pepper inside, but with the tracklistings of BOTH L.P.'s and a date of 1992, plus what looks to me like "Made In Gt. Petersburg" ? ... The rear has the look of a Revolver cover, BUT look closely and it IS different. The insert has a whole page of Russian, which seems to be about Sgt. Pepper's, but could be about anything ! ... and turn it over and one can see a list of all the people on the cover ... but ... once again, in Russian. Take a look at detail of the cover ... it is a DIFFERENT collage in the centre !